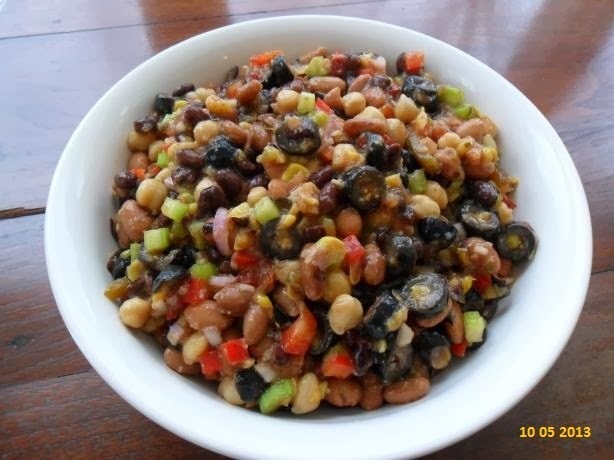 Bean Salad is good recipe for breakfast and for snack also. This salad is rich in Fiber minerals . less calories and fat. time for cooking is less than 30 mins. 2. pressure cook all of them for 4-5 whistles. Some times it took more time depends on the type . Healthy yummy recipe for b'fast or snack ready in less than 30 mins. * One can use canned beans also. In this case start from no. 5 to make the recipe you can add red green and yellow bell pepper also more taste and crunchy flavor. This recipe is good source of Vitamin and mineral less in calories and high in Fiber.